Received 3 August 2010; revised 12 August 2010; accepted 26 August 2010.
main cause of hereditary mental retardation [1-6]. 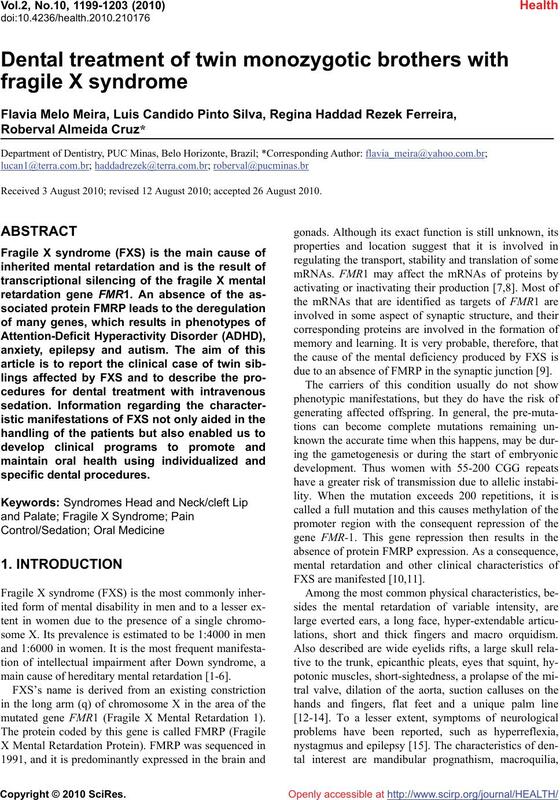 mutated gene FMR1 (Fragile X Mental Retardation 1). due to an absence of FMRP in the synaptic junction . lations, short and thick fingers and macro orquidism. Patients with the FXS have very peculiar personalities. communication skills and poor articulation of words. to reinforce the meanings of words . men who also carry the pre-mutation for the gene FMR1. balance difficulty, anxiety and loss of memory [18,19]. 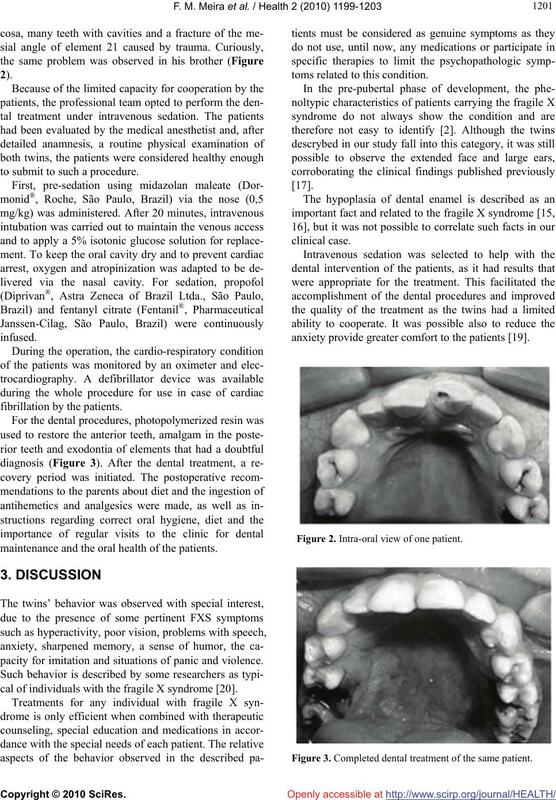 cedures for dental treatment with intravenous sedation. implications for the patient and their family members. circumstance that results in precocious menopause. to submit to such a procedure. 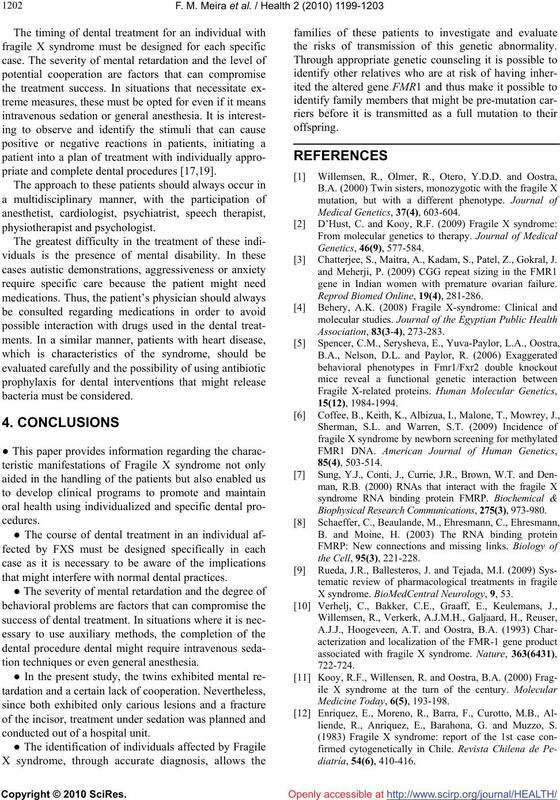 maintenance and the oral health of the patients. pacity for imitation and situations of panic and violence. 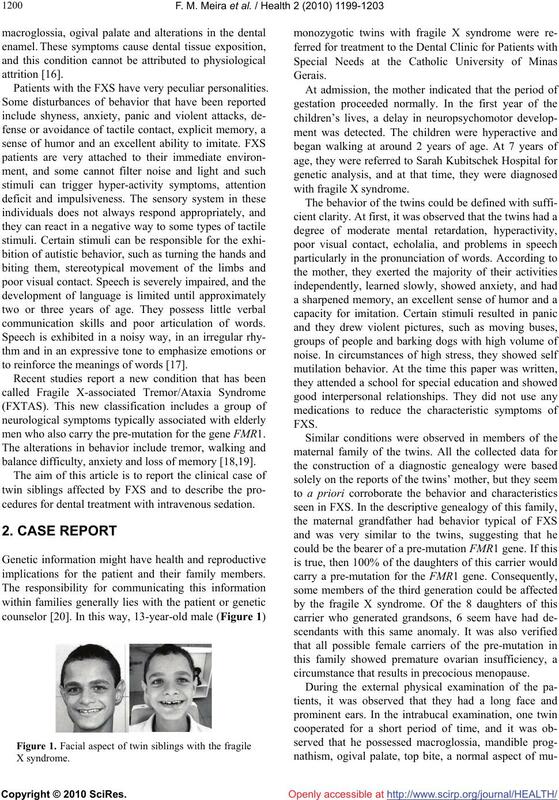 cal of individuals with the fragile X syndrome . toms related to this condition. anxiety provide greater comfort to the patients . Figure 2. Intra-oral view of one patient. Figure 3. Completed dental treatment of the same patient. priate and complete dental procedures [17,19]. that might interfere with normal dental practices. tion techniques or even general anesthesia. conducted out of a hospital unit. the risks of transmission of this genetic abnormality. Chatterjee, S., Maitra, A., Kadam, S., Patel, Z., Gokral, J.
gene in Indian women with premature ovarian failure. Reprod Biomed Online, 19(4), 281-286. Biophysical Research Communications, 275(3), 973-980. X syndrome. 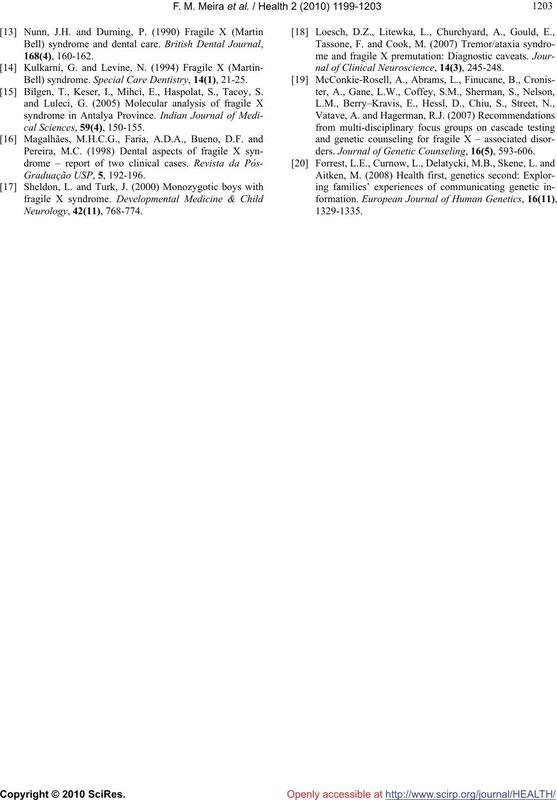 BioMedCentral Neurology, 9, 53.
liende, R., Anriquez, E., Barahona, G. and Muzzo, S.
Bell) syndrome. Special Care Dentistry, 14(1), 21-25. Bilgen, T., Keser, I., Mihci, E., Haspolat, S., Tacoy, S.
nal of Clinical Neuroscience, 14(3), 245-248.
ders. Journal of Genetic Counseling, 16(5), 593-606.